Log in to your student account here. 5th & 7th grade students - please take this survey. We want to know what you think about your school and your experiences. Brain Pop MoviesBrain Pop Movies are short animations that make learning new information and skills fun. Get the username and password from your teacher to access this site. 6th Grade See your teacher for the user name and password. 7th Grade See your teacher for the user name and password. 8th Grade See your teacher for the user name and password. 5th Grade Access the etext using the same password as the ELA site. 6th, 7th, and 8th Grades Use your textbook to find the KEYWORD for each section. 6th, 7th, and 8th Grade Online textbook and other resources that can help you with writing, reading, vocabulary and much more. Get the password from your ELA teacher to create an account. Harvey Mudd College Tutoring Harvey Mudd College's Homework Hotline provides FREE tutoring to students in grades 4-12. The program helps students reinforce math concepts, develop problem solving skills, and become independent learners.The Homework Hotline is open to answer your math/science homework questions from 6PM - 10PM (PST), Sunday through Thursday. Purdue OWL Online Writing Lab The Online Writing Lab (OWL) at Purdue University houses writing resources and instructional material, and we provide these as a free service of the Writing Lab at Purdue. Students, members of the community, and users worldwide will find information to assist with many writing projects. 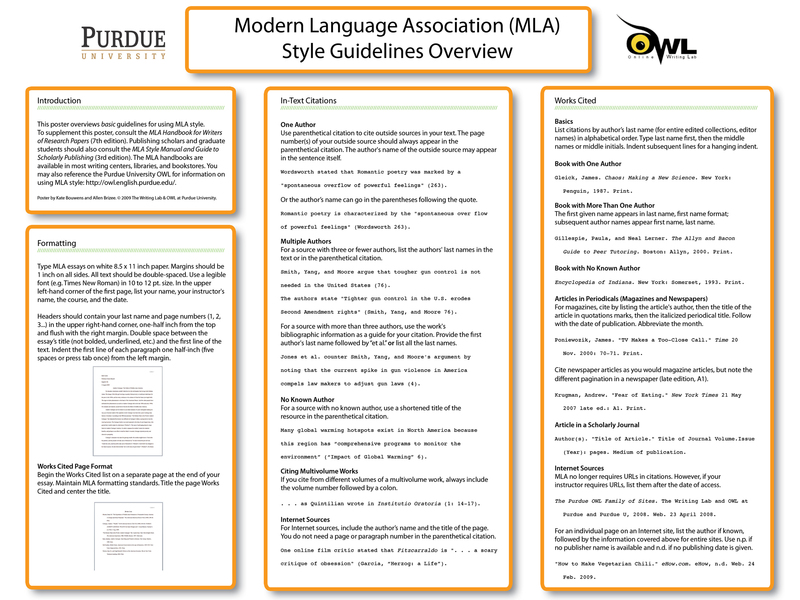 Purdue OWL MLA Citation Poster A comprehensive guide for how to cite a variety of sources. This is our district format for grades 6-8.